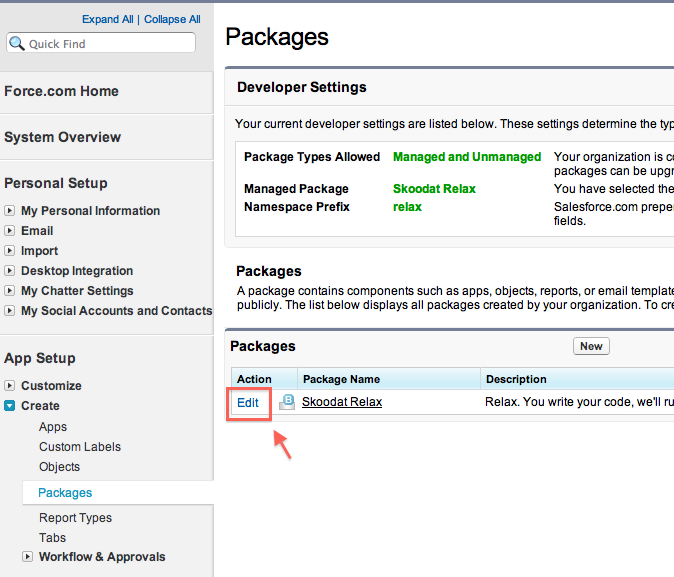 In Winter 12, Salesforce very quietly, and without any fanfare, introduced a capability to Apex that has been something of a holy grail to insane Force.com geeks like myself: the beginnings of support for Reflection in Apex. Which intrepid explorer blazed the trail that led to this prodigious capability? For those of you who keeping score, our silent hero’s name is not Indiana, but Jason. Or, more precisely, JSON. The addition of support for JSON saved ISV’s the immense hassle (and extremely-limiting obstacle) of implementing their own JSON serialization classes, which could very quickly consume all of the 200,000 Script Statements Governor Limit. So needless to say, this alone made native JSON support a godsend to Apex developers. How does this Schema example connect to Trigger Patterns? Well, the reason that the dynamic SObject instantiation from Schema data works is that each Custom and Standard Object in your database is an instance of an interface called “SObject”. An interface is a definition of methods that all implementations of that interface (such as Account, Contact, MyCustomObject__c) must support. This is why can cast any Account, Contact, or custom object record into an SObject and then get access to some of the dynamic methods that the SObject class supports, such as getField(String fieldName) or getSObject() — because each Account, Contact, or CustomObject__c record is not just an instance of an Account, Contact, or CustomObject__c — it’s also an implementation of the SObject interface, which defines the methods getField(), getSObject(), etc. Now, for those of you who were excited about Skoodat Relax, you may have just realized how it all works, and you are absolutely right! 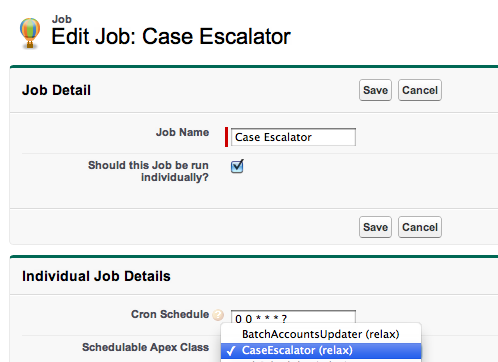 One of the features of Relax is its ability to store the name of a Scheduled Apex Class, and the CRON schedule that dictates when it should be run, in a custom Object called Job__c in Salesforce, and then dynamically activate, deactivate, and run the desired classes at the desired times. And the not-so-secret secret (Relax is on GitHub) behind it is: it all works because of interfaces… and because of native JSON support. With Apex support for interfaces, developers already had, prior to Winter 12, one of the two key tools they needed that would make possible the Apex Holy Grail of dynamic method calls / code execution. The missing tool was the ability to create an implementation of an interface without knowing the class’ name beforehand. In our previous examples, notice how we had to hardcode the name of the implementations, e.g. MyScheduledClass and DestroyBadApples. So where can Salesforce go from here? Well, there is still no direct way to dynamically execute a particular method on an Apex class without hard-coding the method’s name. Support for this would take Reflection in Apex to a whole new level. For now, though, well-crafted Interfaces can usually get around this limitation. The real meat of the work was done early last year when Salesforce R&D was “snowed over” in development for Winter 12, and for the fruit of those 4 months, the Force.com Development community should be immensely thankful. Of all the killer Summer 12 improvements to the Force.com Platform, the one we at Skoodat were most excited about was Post-Install and Uninstall Apex scripts. In a nutshell, they allow developers of Force.com Managed Packages (more posts coming on what these are and how to use them!) to execute arbitrary Apex Code every time that a User installs or uninstalls a version of the developer’s package. This feature is directly targeted at developers’ needs to perform various “setup” and “tear-down” tasks to help prepare customers’ orgs to use their new packages. With the problems of the hack approaches in mind, Apex Install Scripts appeared to be a total godsend! And, largely, they are indeed. You will then see two fields, one for specifying a Post Install Script, and another for specifying a script to run when your package is Uninstalled by a User. In the lookup, you will be prompted to select a class which implements InstallHandler. Be sure your class has COMPILED before trying this — otherwise it may not show up in the list of available classes. Now, release a Managed – Beta version of your package (so that your InstallHandler implementation class does not get locked down in to your package until you are ready). Once you have the install link, install your package into a Sandbox or Partner DE or Test Org (the only places where Managed – Beta packages can be installed). As soon as you are finished with the 2-3 step install instructions, your Post Install Script will be run. To run your Uninstall Script, uninstall this package. Who do Install Scripts execute as? Based on Source (DE) Org, or Destination Org? What code/resources in the Destination Org do Install Scripts have access to? Global methods in Apex Classes in Managed Apps that the Install Script’s app extends? Which Namespaces / Managed Apps do Install Scripts have access to? All apps? Just the installer’s app? Or any Site Licensed apps? Neither the User nor Profile exist in either Source or Destination orgs. This User / Profile can create / modify records of Standard objects as well as Custom Objects / Custom Settings that come with the package being installed. Example: PermissionsModifyAllData returns FALSE on the Install Script User’s Profile / PermissionSet, but the InstallScript CAN modify all data! Consequences: Do NOT try to dynamically determine whether to permit DML based on permissions from within Install Scripts. You will get very frustrated. If you’re wondering how I verified this information, here’s a Post Install Script I used to determine this information. Basically it spits out some Describe information on some standard objects (Account and Contact) as well as a custom object in the source developer org (relax__Job__c). I also spit out the username and profileId of the running user, by which I discovered that the running user is in fact a “phantom” with all the powers of System. Here’s the complete InstallScript. After assembling a debug string, it calls a helper method that emails me the content. As you can see, Schema methods universally return false, and a quick trip to SOQLExplorer will reveal that neither the User or Profile executing this Script exists in either Source or Destination org. So much easier than making a custom setup page, and it happens instantly! We’re definitely looking forward to more improvements to this feature in Winter 13 and beyond, especially when we can have public implementations of global interfaces. Moreover, Winter 13 will include some sweet new methods for working with Static Resource data in Tests, so I may just be convinced to post an example of creating custom config object records in an InstallHandler from data stored in Static Resources as JSON/XML — so keep posted! I recently stumbled upon a post by Matt Bingham on Salesforce StackExchange where he documents that there is a huge difference between marking your Install Script as without sharing , e.g. I have also seen that there are some objects, such as the Chatter Group object (CollaborationGroup) that you can only interact with fully from Install Scripts in this “super-user” mode. Regarding inaccurate PermissionSet / Profile data, I have also run into another frustrating wrinkle: the Install Script User does have a Profile, but this Profile is not queryable, and so any logic in your app that you have related to querying on the running user’s Profile or PermissionSetAssignments will NOT work, because (a) the User’s Profile record does not exist (you get the error “SObject has no rows for assignment”) and (b) the PermissionSetAssignments relationship on User is not visible from the InstallScript context (you get the error “Didn’t understand relationship PermissionSetAssignments”). Therefore, you’ll have to write special logic related to the scenario where the User’s Profile record does not exist, to avoid query exceptions. Wicked cool UI platform for Force.com, or not? We at Skoodat are considering exposing the platform for we use for rapidly building and deploying killer custom UI’s on Force.com — aka Skoodat Skuid. But we’re looking for your feedback: are we crazy, or does this totally excite you? Let us know! Skoodat Skuid — Wicked cool UI platform for Force.com, or not? A recent (well, maybe not so recent — is it June already???) blog post by Matt Lacey really struck a chord with me. Matt highlights one of the biggest developer woes related to using Scheduled Apex — whenever you want to deploy code that is in some way referenced by an Apex Class (or classes) that is/are scheduled, you have to unschedule all of these classes. With Spring 12, Salesforce upped the limit on the number of Scheduled Apex Classes from 10 to 25 (ha–lellujah! ha–lellujah!). However, with 15 more scheduled jobs to work with, this have-to-unschedule-before-deploying problem becomes even more of a pain. But this isn’t the only woe developers have related to asynchronous Apex. An issue that has shown up a lot lately on the Force.com Developer Boards and LinkedIn Groups is that of running Batch Apex jobs in sequence — run one batch job, then run another immediately afterwards. Cory Cowgill published an excellent solution for accomplishing this, and this has been the go-to method for linking Batch Apex jobs ever since. But one of the problems with his method is that it leaves a trail of scheduled jobs lying in its wake — seriously cluttering your CronTrigger table. If you want to run these batch process sequences often — e.g. kicking them off from a trigger, or running them every day (or even every hour! ), you have to start “managing” your scheduled jobs more effectively. A third issue often cited by developers is the frequency at which jobs can be run. Through the UI, a single CronTrigger can only be scheduled to run once a day. Through code, you can get down to once an hour. If you wanted to, say, run a process once every 15 minutes, you’d have to schedule the same class 4 times — using up 4/25 (16%) of your allotted scheduled jobs — and you have to manage this through Apex, not the UI. As I mulled over these issues, I thought, there’s got to be a better way. Broadly speaking, Relax seeks to address all of these challenges, and a whole lot more. 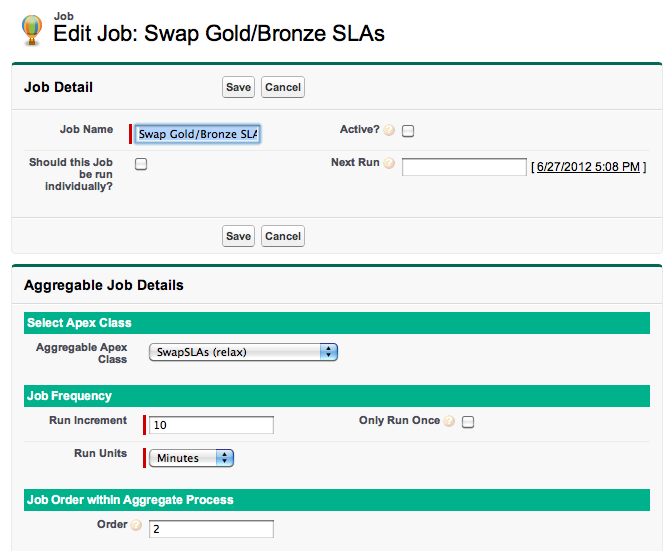 Manage all your individually-scheduled Apex jobs in data records (through a Job__c object). Jobs can be mass scheduled and mass aborted, or mass exported between orgs, and then relaunched with clicks, not code. Create and schedule ordered Batch Apex “chains” of virtually unlimited length, with each “link” in the chain kicking off the next link as soon as it finishes. And all of your chained processes are handled by, on average, ONE Scheduled Job. Schedule jobs to be run as often as EVERY 1 MINUTE. ONE. UNO. In Relax, there are 2 types of jobs: individual and aggregable. You create a separate Job__c record corresponding to each of your Individual jobs, and all of the detail about each job is stored in its record. You can then separately or mass activate / deactivate your jobs simply by flipping the Active? checkbox. Each Individual job is separately scheduled — meaning there’s a one-to-one mapping between a CronTrigger record and an Individual Job__c record. Here’s what it looks like to create an Individual Job. You simply specify the CRON schedule defining when the job should run, and choose a class to run from a drop-down of Schedulable Apex Classes. That’s it! As long as you call the complete() method at the end of your finish() method, relax will be able to keep infinitely-long chains of Batch Jobs going. Plus, this framework is merely an extension to Database.batchable — meaning you can still call Database.executeBatch() on your aggregable Batch Apex and use it outside of the context of Relax. Every time Relax Job Scheduler runs, the very first thing it does is schedules itself to run again — regardless of what happens during any processing that it initiates. It queries the “Next Run” field on each Active, Aggregable Job__c record that’s not already currently being run, and if Next Run is less than now, it queues it up to be run as part of a Relax “Process”. Each Process can have an arbitrary number of ProcessSteps, which will be executed sequentially until none remain. If both the current and next ProcessSteps are BatchableProcessSteps, Relax uses a “Process Balloon” to keep the Process “afloat” — essentially launching a temporary scheduled job that is immediately thrown away as soon as the next ProcessStep is begun. Another powerful feature of Relax is the ability to effortlessly launch one-off, one-time scheduled jobs, without having to worry about cluttering the CronTrigger table with another scheduled job. It takes just 1 line of code, AND you can specify the name of the class to run dynamically — e.g. as a String! Reflection ROCKS!!! Please send me any feedback you may have! What would make this more usable for you? I’ll probably be releasing the app within the next month or so, so stay tuned! This is awesome, right? Quick, let’s throw a Custom Link on the Account Detail Page called “Enrollments” that links to this report, but passing in the Id of the Report! Yeah, yeah, yeah! I love this! This is where the ISV’s hang their heads in sadness… sorry son, it just ain’t that easy. What’s the matter, grandpa? Come on, this is child’s play! Notice where we said that we’d be passing in the ID of the Report. Hard-coded. For an ISV, ID’s are the ultimate taboo. Why? Well, sure, you can package up the Report and Custom Link. But as soon as you install the package into a customer’s org, the Id of the Report has CHANGED — and the link is BROKEN. It’s a situation that the typical one-org Admin will never have to face, but, well, welcome to the world of the ISV. Isn’t there one of those handy Global Variables which lets you grab the Name or DeveloperName of a Report? 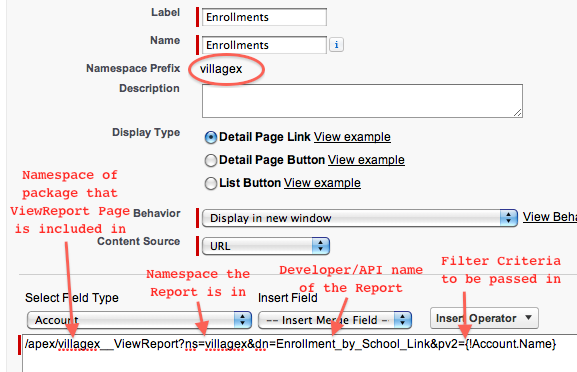 Well, you write a ‘ViewReport’ Visualforce page that takes in the API name of a Report — which does NOT change across all the orgs that a package is installed into — and uses this API name to find the ID of the Report and send you to it. What does this look like? // because we can't insert test Reports. Voila! A ISV-caliber way to link to any Report in any Managed Package, and it won’t break in an org where the package is installed! We ‘tack-on’ to the resultant page reference any OTHER page parameters that the user passed along, so we can pass in any number of dynamic Filter Criteria parameters using the pv<n> syntax. You may be wondering — wait, you can QUERY on the Report object? Yep! Reports are technically SObjects, so you can query for them, but they fall under the mysterious category called “Setup” objects which, among other peculiar quirks (Google “MIXED_DML_OPERATION” for one of the more annoying ones), only selectively obey CRUD and only expose some of their fields to SOQL. Fortunately, for our purposes, the Id, Name, DeveloperName, and NamespacePrefix fields are all included in this short list. Actually, fire up SOQLXplorer — you might be inspired by some of the other fields that are exposed. Namespacing of Reports — Reports included in Managed Packages don’t have to have a globally unique name — they only have to be unique within their Namespace. Therefore, when querying for Reports, it’s best to query for a report within a particular namespace. If the Report is not found — in our example, we send the User to the Reports tab. You might want to do something different. Anonymous Apex can be extremely useful when trying to perform complex, cross-object, bulk data manipulation tasks that might only need to be done once, and never used again. For such situations, writing a piece of code to achieve your functionality, writing test code, and deploying it to production — when you might never use the code again — doesn’t make much sense. Enter Anonymous Apex! What if you could verify that your long, convoluted Anonymous Apex routine was actually doing what it was supposed to do as it proceeded, similar to the way Apex Unit Tests work with System.asserts? Well, you can! Anonymous Apex supports all of the System.assert statements, AND it supports Database.rollbacks. When the two are used in tandem, you get a powerful disaster prevention mechanism that makes Anonymous Apex a lot less risky and hackish. I often find that code that starts out as Anonymous Apex routines eventually makes its way into actual classes / controllers / triggers —- and Unit Tests. If you haven’t used Anonymous Apex before, you can use it from all sorts of locations — from the Fore.com System Log (old or new — the new version has excellent code/syntax highlighting), from the Force.com IDE, or from SoqlXplorer (on the Mac)).